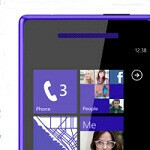 Next HTC Windows Phone codenamed “Tiara,” first post-Portico device? On the heels of learning about HTC’s intentions to continue making Windows Phone devices, even in the face of disappointing sales. That is good news and it sets the stage to wonder what HTC might have in store for us. Well as it happens some specifications have leaked. 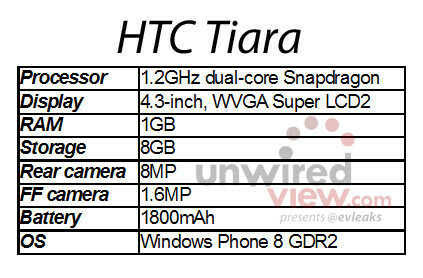 The next iteration of Windows Phone by HTC, code named “Tiara” will be a bit more modest in nature. For those wondering if it will follow the same design language as the newly announced HTC One, the rumor is that it will not. The Tiara will have the distinction of being one of the first Windows Phone devices running on the second major update to Windows Phone 8 (post Portico), referred to Windows Phone 8 GDR2 (General Distribution Release). Spec-wise, it does not look like it will make you break out into any sweats, but that might make it more accessible price-wise. Tiara will have a 4.3-inch super LCD2 screen with 800x480 WVGA resolution. An 1,800mAh battery will be feeding power to a dual-core 1.2Ghz Qualcomm Snapdragon processor which will be more than capable to handle the smooth work of the operating system. 1GB of RAM and 8GB of storage will be on board, though there is no indication about microSD card support. The main camera is 8MP with a 1.6MP front facing camera. We will see how these numbers hold up to whatever the final product looks like at launch, but what do you think? Does this strike you as the right direction to move a product line? sounds a bit girly ..
That's not enough storage if it doesn't have an SD slot. It least the specs indicate that the next update for Windows Phone and will be available for all devices. Very "meh". They need a wider variety, like an evolved Titan 2, and a One running Windows Phone 8. The WP8X has a great design, but was handicapped by its smaller screen and lack of flagship "specialness" in comparison to the Lumia 920. I think 8X tops NL820 because of the higher resolutions, it's the same as NL920. dude how the hell is the lumia 620 better than 8s ?? it has 8GB internal storage (8S only has 4GB); it has Nokia specific apps (Drive, Lenses, offline navigation); it has overall better build quality. Well what can you expect from htc? Anemic batteries as usual ^_^ but wait... It's thinner. So that should make the price higher than the 720. Smh htc never listens. eh....PA....you do know thats an image of WP7.5?? The 8x is already midrange. We want a quad core processor, that new htc one camera, bigger battery, aluminum design, front facing speakers, bigger screen, and more. I can go on. Windows phone moves so slow. I might be going back to android if the Moto X is affordable. I just want the best phone that can be made, not just what's 'good enough' since it's a windows phone. I want a windows phone that has just as high tech hardware as android phones. That's the way it was when the first windows phones came out. They fell behind along the way and made excuses for themselves by having a very light, simple OS. The qHD resolution is not supported by WP8. Only 800x480, 1280x720, & 1280x768. What's with the girly names? Butterfly then tiara? What's next? Jessica, lipstick, lingerie, Brittany, mascara? Lol. Girly names aside, HTC still makes good phones, though.